OSWEGO, NY – The Oswego YMCA’s Oswego Dragon Festival Committee announced that it is adding a new component to the 2014 festival – The Heroes’ Challenge. Five of Oswego’s service organizations Oswego Police Department, Oswego Fire Department, the U.S Coast Guard, SUNY Oswego University Police and SAVAC will race one another for the title of Oswego Dragon Festival Heroes’ Challenge Champion. 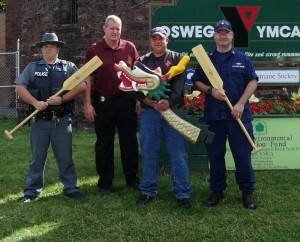 Representatives from the Oswego Police Department, Oswego Fire Department, the U.S Coast Guard, SUNY Oswego University Police and SAVAC will compete for the title of Oswego Dragon Festival Heroes’ Challenge Champion. This race will take place on September 5 at 6 p.m. The Heroes’ Challenge takes place during team practices for the Oswego Dragon Festival. Practice for teams will begin at 4 p.m.
During this event, the Oswego Dragon Festival is hosting a chicken BBQ to support the Oswego YMCA’s Strong Kids Campaign. Tickets can be purchased before the event for $8 at the Oswego YMCA, FitzGibbons Real Estate and Insurance, C’s Farm and Beverage Center, and Gibby’s. Tickets will be $10 the day of the event. Chicken BBQ for the event is being put on by Gibby O’Connor. A beer garden, sponsored by Greene’s Ale House with celebrity bartenders will also be in the park. All proceeds from both will be donated to the Strong Kids Campaign. Live music will be provided from 5 to 8 p.m. by local band, The Love Volcanoes. This event is open to the public and all are welcome to come enjoy the Heroes’ Challenge race, practices, and music. The event lasts from 5 to 8 p.m. at Breitbeck Park.